History of Prehistoric Chinese Cultures. For more about Neolithic crafts in Asia, see: Asian Art (from 38,000 BCE). Chinese art during the Neolithic era - the final stage in the history of Prehistoric art - emerged during the period 7500 BCE to 2000 BCE. Neolithic culture was characterized by a more settled lifestyle, based on farming and rearing of domesticated animals, its use of more sophisticated tools led directly to a growth in crafts such as pottery and weaving. Even though most ancient art in China, as elsewhere, remained largely functional in nature, artists were also able to focus on ornamentation and decoration, as well as primitive forms of jewellery art involving jade carving and precious metalwork. Other types of art introduced during the Neolithic included wood-carving and relief sculpture, as well as ivory carving and freestanding stone sculpture. 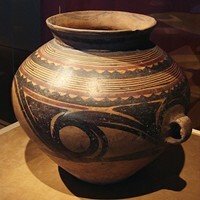 But the key medium of Neolithic art in China (as elsewhere) was Chinese Pottery, a style of ancient pottery characterized by a wide range of delicate, polished and coloured vessels for both functional and ceremonial purposes. Chinese Stone Age art during the Neolithic period has been classified by archeologists into a mosaic of some 22 regional cultures whose influence and importance are still being determined. These overlapping cultures grew up mostly along the Yellow and Yangtze river valleys (see below). See also: Traditional Chinese Art: Characteristics. Ceramic art was the defining creative activity of Neolithic society in China. The earliest pots to appear were almost exclusively utilitarian earthenware, hand-made (by coiling), mainly red in colour and fired in bonfires. Decorative designs were applied by stamping, impressing and other simple techniques. The painted bands seen on this pottery may represent prototype examples of the Painted Pottery culture, which flourished during the period 4,000-2,000 BCE. To see how Chinese Neolithic pots fit into the evolution of ceramics, see: Pottery Timeline (26,000 BCE - 1900). Silk-making, the characteristic Chinese textile process, also began during the 6th millennium. Early Neolithic Chinese artists are also known for their famous Jiahu Carvings - turquoise carvings and bone flutes - discovered in the Yellow River Basin of Henan Province, Central China, around 7000-5700 BCE. Chinese Middle Neolithic art is represented by deep-bodied jugs, red or red-brown ware, notably pointed-bottomed amphorae. In the East of the country, pottery was characterized by fine clay or sand-tempered pots ornamented with comb markings, incised markings, and narrow, appliqued bands. In the region of the lower Yangtze River, porous, charcoal-tempered black pottery was produced, featuring cauldrons, as well as cups and bowls. In addition, carvings and other forms of sculpture began to appear - including a number of remarkable bird designs carved on bone and ivory - as well as the earliest examples of Chinese lacquerware. See also: Mesopotamian Art (4500-539 BCE). Chinese Late Neolithic pottery includes a range of delicate, coloured and polished, ceremonial vessels, exemplifying the Painted Pottery culture of the age. These featured burnished bowls and basins of fine red pottery, a proportion of which were painted, usually in black, with spirals, dots and flowing lines. In the northeast the Hongshan culture was characterized by small bowls, fine painted pottery, as well as jade amulets in the shape of birds, turtles, and dragons. The middle and lower Yangtze River valley cultures were known for their ring-footed vessels, ceramic whorls, eggshell-thin goblets and bowls decorated with black or orange designs; double-waisted bowls. For a comparison, see also: Ancient Persian Art (from 3500 BCE). By 3000 BCE, Chinese ceramicists had attained a craftsmanship and elegance which was quite exceptional. Designs included gourd-shaped panels, sawtooth lines, radial spirals, and zoomorphic figures. The predominant Longshan Culture (3000-2000 BCE) was characterized by its lustrous, eggshell-thin black pottery, and its proficiency in componential construction - in which spouts, legs, and handles were added to the basic form. In addition to fine pottery, the Late Neolithic in China witnessed the development of jade carving, lacquering and other jewellery crafts, confirmed by the increasing number of precious artifacts discovered in the graves of wealthy individuals. It was also during the third millennium that bronze metallurgy evolved. The earliest known bronze objects in China were found in the Majiayao culture site, dating to between 3100 and 2700 BCE. painting/sculpture, see: Oldest Stone Age Art: Top 100 Artworks. Based around the central Yangtze River region in northwestern Hunan, among artifacts found in Pengtoushan graves was cord-marked pottery. Compare Pengtoushan pottery with Jomon pottery, the earliest form of Japanese Art, which was typically supported in baskets which were destroyed by the firing process and whose weaving left its trace on the belly. Centered on the Yi-Luo river basin valley in Henan. Typical Peiligang artifacts include a diverse assortment of ceramic items, mainly for functional purposes such as storage and cooking. Located along the Inner Mongolia-Liaoning border. Xinglongwa culture is noted for its cylindrical pottery, as well as a limited amount of jade objects. Based around the Yellow River in southern Hebei, noted for its tripod pottery. Located in Gansu and western Shaanxi, it shared several features in common with the Cishan and Peiligang cultures. Centered on the lower Liao River on the Liaodong Peninsula. Archeological digs have produced numerous Xinle artifacts including pottery, jade objects, and some of the oldest wood carvings in the world. Centered on the Luan River valley in Inner Mongolia and northern Hebei, it is noted for its pottery vessels decorated with geometric and zoomorphic designs, and its stone and terracotta figurines. This was centered on Shandong. Based around Yuyao and Zhoushan, Zhejiang, as well as the islands of Zhoushan. It is known for its chunky, black-coloured, porous pottery, often embellished with plant and geometric designs. Hemudu artists also produced carved jade objects, carved ivory ornaments and small, clay sculptures. Centered around the Three Gorges region of the middle Yangtze River, the culture is noted for its dou (cylindrical bottles), white pan (plates), red pottery, and jade ornaments. Located in the Taihu Lake area and north of Hangzhou Bay, it spread across southern Jiangsu and northern Zhejiang. It is known for its jade ornaments and ivories. One of the most important of the so-called Painted Pottery cultures of the Chinese Neolithic era, it flourished in Henan, Shaanxi, and Shanxi. Discovered by the Swedish archeologist Johan Gunnar Andersson and named after its type site, Yangshao, in Henan, it evolved in several stages, classified according to pottery styles, as follows: (1) Banpo stage (4800-4200). (2) Miaodigou stage (4000-3000). (3) Majiayao stage (3300-2000). (4) Banshan stage (2700-2300). (5) Machang stage (2400-2000). Chinese painters of the Yangshao culture were noted for their excellent white, red, and black painted pottery decorated with human, animal, and geometric designs. Certain incised markings on Yangshao pottery have been speculatively interpreted as an early form of Chinese writing. The Yangshao culture is also noted for its early production of silk. Discovered by the Japanese archeologist Torii Ryuzo in 1908 and excavated in the 1930s by Kosaku Hamada and Mizuno Seiichi, this culture evolved in Inner Mongolia, Liaoning, and Hebei in northeastern China. Hongshan artists are known for their jade carvings (especially their pig dragons), copper rings and clay figurines, including statuettes of pregnant women. At Niuheliang, archeologists uncovered an underground religious complex containing a quantity of painted ceramic vessels and decorated with mural paintings - see also: Chinese Painting. Tombs excavated nearby were found to contain jade objects, as well as sculptures of dragons and tortoises. The Hongshan people attributed particular importance to jade. Several types of jade were used in carving - including light-green, cream or even blackish-green - and popular shapes included a creature with the head of a pig (or bear) and the curled body of a dragon. Examples can be seen in the Liaoning Provincial Institute of Archeology, Shenyang. Centered on Shandong, Anhui, Henan, and Jiangsu, and best known for its turquoise, jade and ivory carvings, as well as its long-stemmed ceramic cups, it is divided into three main stages, according to objects discovered in graves: (1) Early phase: c.4100-3500. (2) Middle phase: c.3500-3000. (3) Late phase: c.3000-2600. This was the last Neolithic jade culture of the Yangtze River Delta, and is famous for its tomb artifacts, featuring finely worked jade objects - made from tremolite, actinolite and serpentine jades - including pendants engraved with decorative designs of birds, turtles and fish. Liangzhu artists were also noted for their silk, ivory and lacquer objects, as well as their fine pottery. Liangzhu art is exemplified by its mysterious jade congs - cylindrical tubes encased in rectangular blocks - which were associated with Neolithic shamanism, and which anticipated the taotie design of Shang and Zhou Dynasty bronzes. Examples can be seen in the Zhejiang Provincial Institute of Archeology, Hangzhou. Compare Liangzhu culture with Egyptian Art (3100 onwards). Located in the upper Yellow River region in Gansu and Qinghai, it is noted for its pioneering copper and bronze objects, as well as its painted pottery. Centered around the middle Yangtze River region in Hubei and Hunan, it is famous for its signature ceramic balls, painted spindle whorls, and egg shell pottery. Based in the central and lower Yellow River region, and named after the town of Longshan, home of the original Chengziya archeological site, Longshan artists were noted for their ceramic work - especially their highly polished, black-coloured, thin-walled egg-shell pottery. Working with refined clay, a fast potter's wheel and a very hot kiln, Longshan ceramicists produced some exceptional items, including tall, thin, ceremonial "stem cups", with sides typically no more than 0.5 millimetres thick. These fine objects inspired the slender, wide-mouthed wine goblets, known as gu, made during the later era of Shang Dynasty art (c.1600-1000 BCE). Longshan Culture is also known for its sericulture (silk production). Centered on the Chengdu Plain, it is known for its pottery as well as its early pebble-dash architecture. Based around the middle Yangtze River region in Hubei, it is noted for its painted spindle whorls, inherited from the preceding Qujialing culture, its pottery figurines and distinctive jade carvings. Although Chinese Bronze Age art originated in the upper Yellow River region around the end of the 4th millennium BCE (c.3100), Bronze metallurgy is more closely associated with Erlitou Cultural developments (2100-1500) under the Xia Dynasty (c.2100-1700 BCE) and the early Shang Dynasty between 1700 and 1500 BCE - see, for instance the famous Sanxingdui Bronzes (1200 BCE). Meantime the US National Gallery of Art, Washington DC., defines the Bronze Age in China as spanning the period c.2000-770 BCE. Described in ancient historical chronicles, the Xia Dynasty was China's first dynasty. For more, see: Xia Dynasty Culture (2100-1700).  For more about Neolithic culture in ancient China, see: Homepage.